This looks like a great app for the early learners! It first requires the child to match letters in the alphabet, then put the letters in order, and then moves on to finding the missing letters. The activities can be done with upper or lowercase letters. 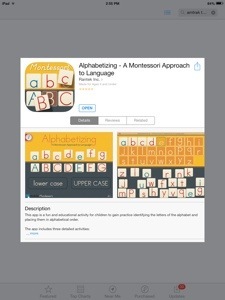 Posted in apps and tagged alphabet, Apps, early literacy. Bookmark the permalink. I recently spent three days in Michigan touring schools that do inclusive education really well. Our group’s host was an organization called CLC. I went on the trip with 4 administrators. This trip was a blessing in many ways. I have felt inspired to try some of the things that I saw and reorganize and share! The value of each child is valued here, regardless of his ability to complete the curriculum. Posted in Classroom, Uncategorized and tagged inclusive education. Bookmark the permalink. 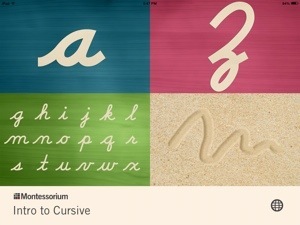 Useful app this week: Intro to Cursive. It was free one day on Apps Gone Free so I tried it with a third grader and definitely recommend it for extra cursive practice at home or at school. Posted in apps and tagged Apps, cursive. Bookmark the permalink.